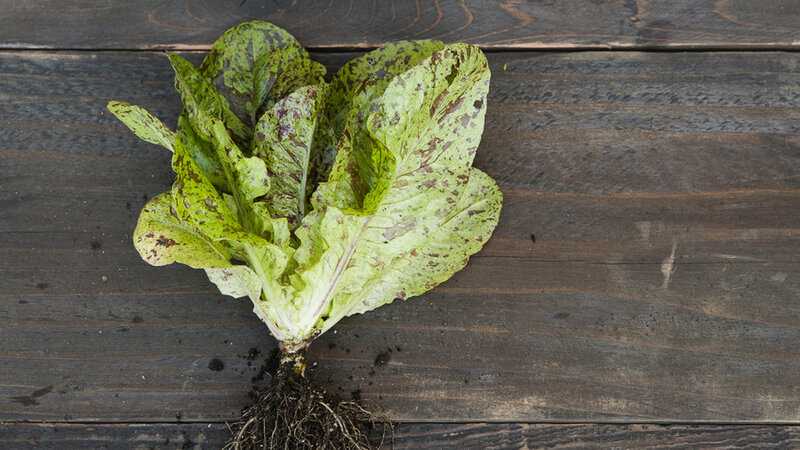 Lettuce is an easy and rewarding cool-season crop to grow at home. 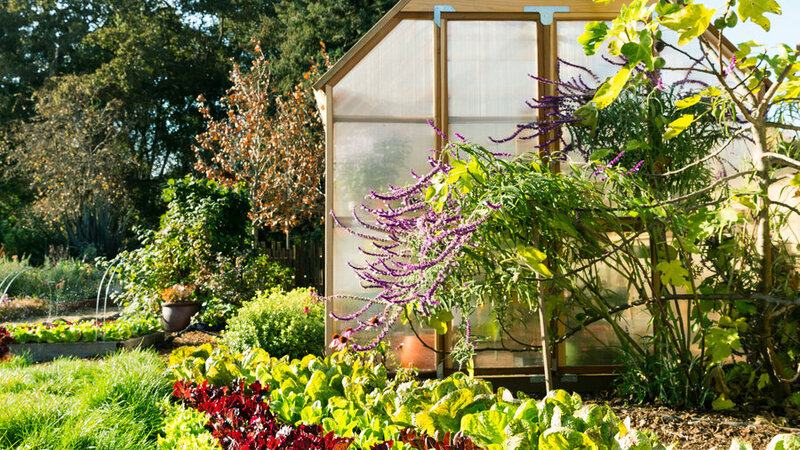 Plants start readily from seed and produce tender leaves that can be harvested for crisp and colorful salads. 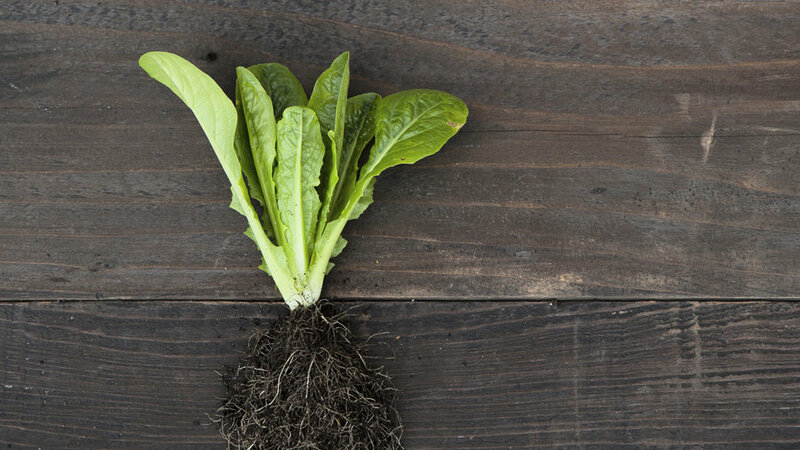 In mild climates, start lettuce from seed in late summer or plant seedlings in fall for an early winter harvest. Replant again in spring for a second crop. In cold areas, wait to start from seed or plant seedlings until after the last frost in spring. All lettuces thrive planted in an area with full sun to part shade and well-drained soil. 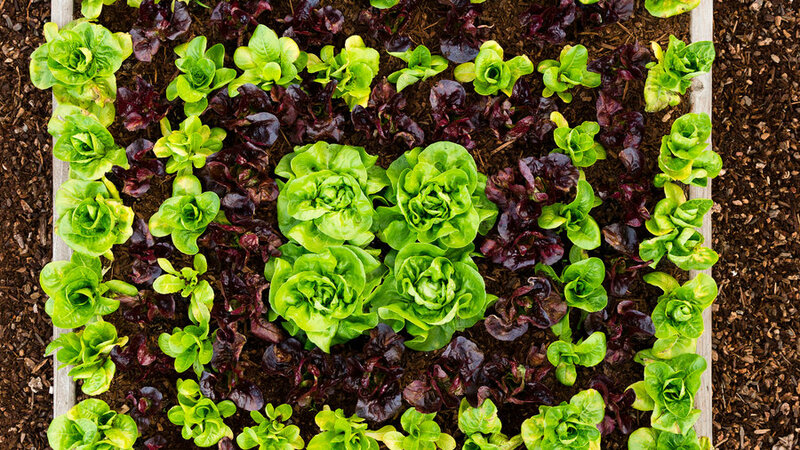 A mix of butterhead and romaine lettuce varieties make a bold statement planted in a geometric pattern. The bright green rosettes of four ‘Garden Babies’ butterhead (center) contrast with bands of deep burgundy ‘Ruby Gem’ romaine. Rows of ‘Sweetie Baby’ romaine form the two outer green squares. 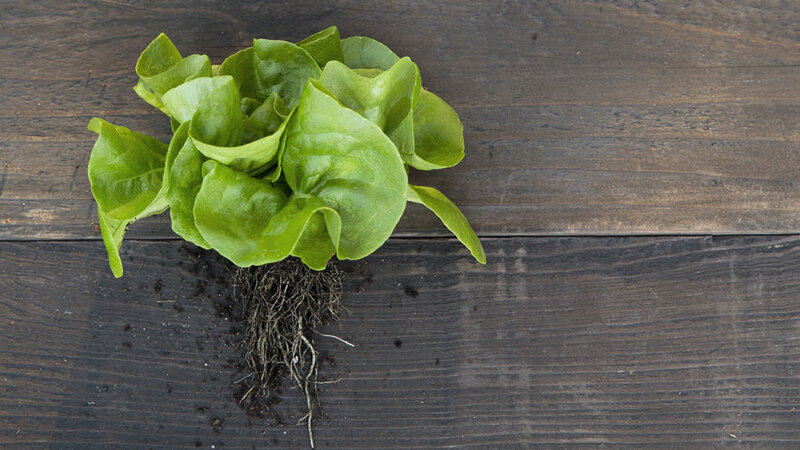 Lettuce plants grow best in fast-draining, nutrient rich soil. 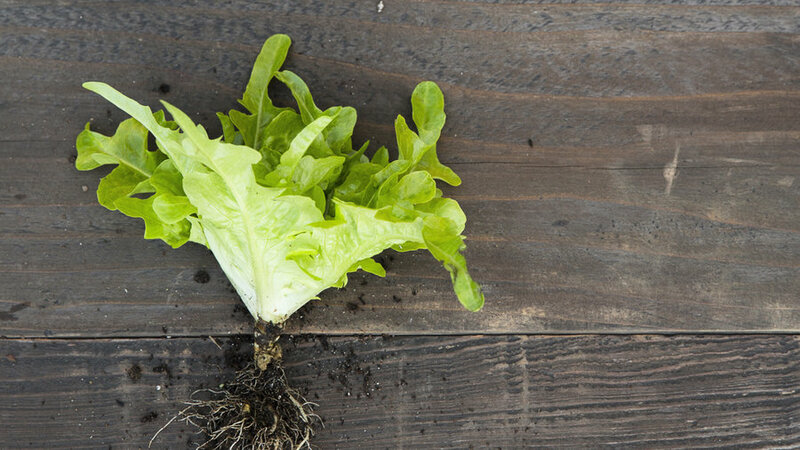 In gardens with clay soil or poor drainage, grow lettuces in raised beds for healthier plants. The elevated soil in raised beds makes harvesting easy. A single pot of lettuce in a sunny corner of the deck can provide enough fresh leaves to snip for salads. Loose-leaf varieties are best for containers since seedlings can be planted closer together than head-forming lettuce types and harvesting does not sacrifice the plan. For an eye-catching fall patio container, plant ruffled ‘Lollo di Vino’ lettuce in glazed red ceramic to play up the wine-colored foliage. Mustard greens add a peppery bite and interesting texture to salads. Most varieties are easy to grow and will thrive planted in full sun either in the ground or in a container. In this unglazed ceramic pot (measuring 14 inches wide and 12 inches deep), we’re growing burgundy ‘Osaka Purple’ mustard and ruffled green ‘Southern Giant Curled’ as well as frilly ‘Lime Streaked’ and ‘Red Streaked’ mizuna. There are four main types of lettuce: cripshead, butterhead (Boston), loose-leaf, and romaine, most of which come both in green and red. 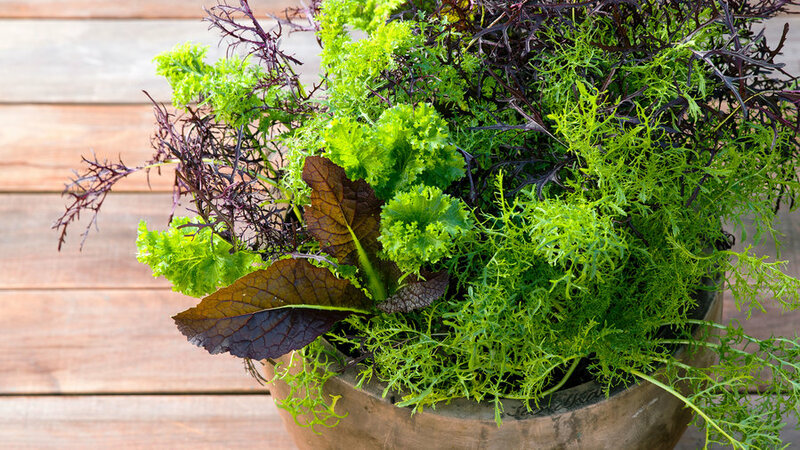 In a typical store-bought mesclun mix, you will most likely find a selection of loose-leaf and romaine varieties. 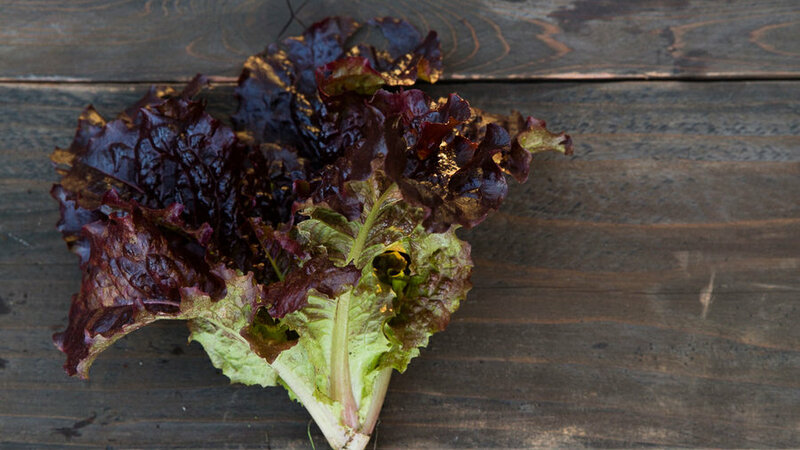 To kick salads up a notch, we like to add spicy mustard greens, a romaine with wine-colored freckles, and other unusual varieties grown straight from our garden. The broad, oval-shaped leaves of ‘Osaka Purple’ have a spicy flavor that intensifies as leaves mature. For salads, harvest when leaves are young and tender. Steam or stir-fry mature leaves. ‘Osaka Purple’ is a particularly vigorous grower, pest-resistant, and can withstand frost. 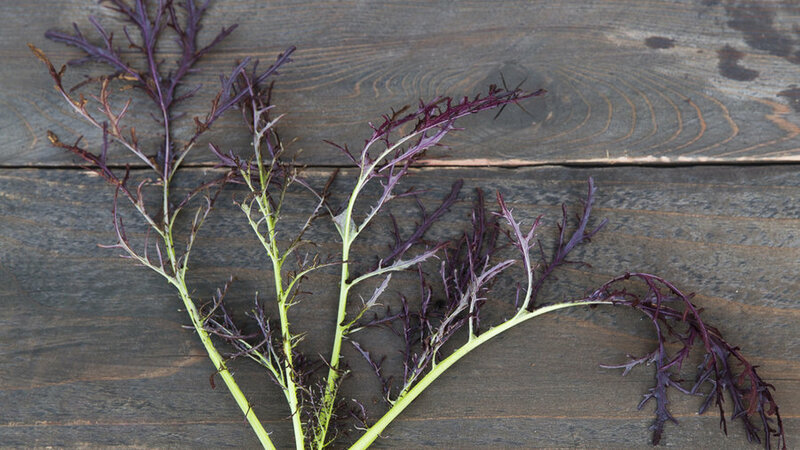 Bright chartreuse leaves of ‘Lime Streaked’ mizuna have a delicate, lace-like form that makes a nice accent in salads. The tangy, bright flavor is best appreciated in young leaves. Pairs well with red mizuna. 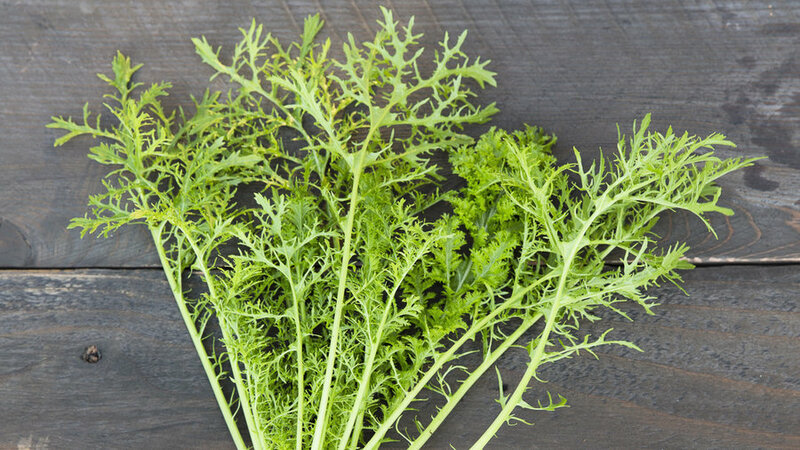 The richer, more pungent flavor or ‘Red Streaked’ mizuna adds a zesty bite to salads. Baby leaves can be harvested to eat raw or allowed to mature and eat steamed or braised. Both ‘Lime Streaked’ and ‘Red Streaked’ mizunas start easily from seed and are frost tolerant. Originally bred for the Japanese luxury fresh market trade, these compact butterheads have deliciously sweet flavor and a nice crunchy texture. ‘Garden Babies’ form small 6-inch heads at maturity – perfect for a small salad or filled with cooked, ground meat and used as lettuce cups. Plants are heat tolerant and slow to bolt. This baby romaine hybrid forms plump two-toned rosettes. Harvest the entire head and cut in half for salads to show off the vibrant green heart surrounded by ruby-colored leaves. Texture is crisp and juicy with a mild romaine flavor. 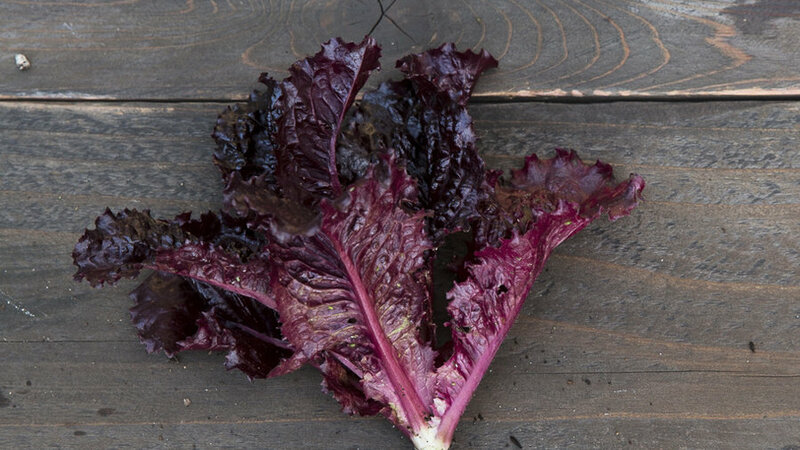 One of the deepest burgundy lettuces available, ‘Merlot’ is striking both in the garden and on the plate. 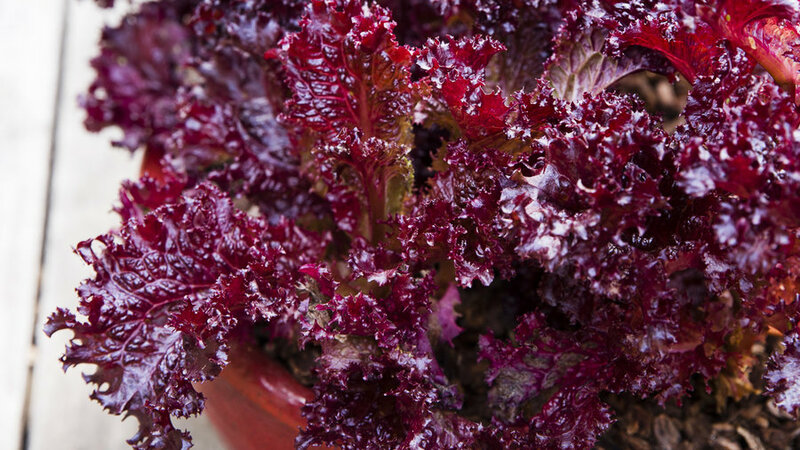 Curled, glossy leaves are richly wine-colored and high in antioxidants. Pick outer leaves while still tender or cut back the whole plant down to a 2-inch stem and leaves will regrow for a second harvest. This heirloom lettuce has particularly dramatic coloration with green leaves splashed with red. 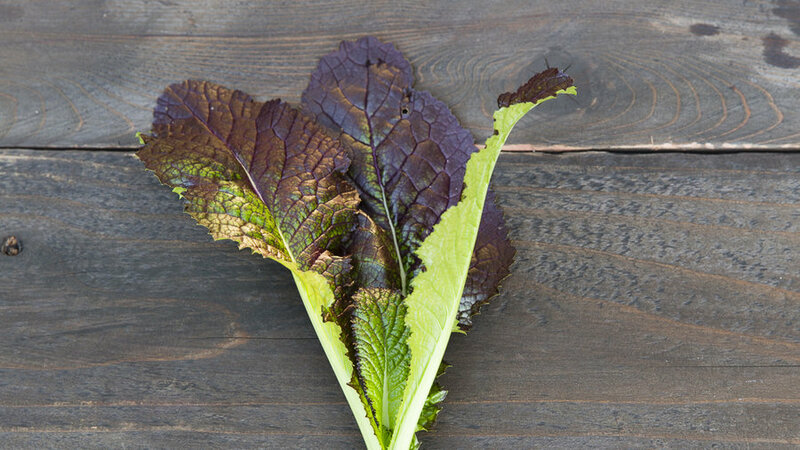 The broad leaves have a crisp texture and mild romaine flavor. Plants are slow to bolt and the ruby-colored speckles deepen with heat. Brightly colored, notched leaves give this open-head formed lettuce its name, which translates to Canary’s Tongue. 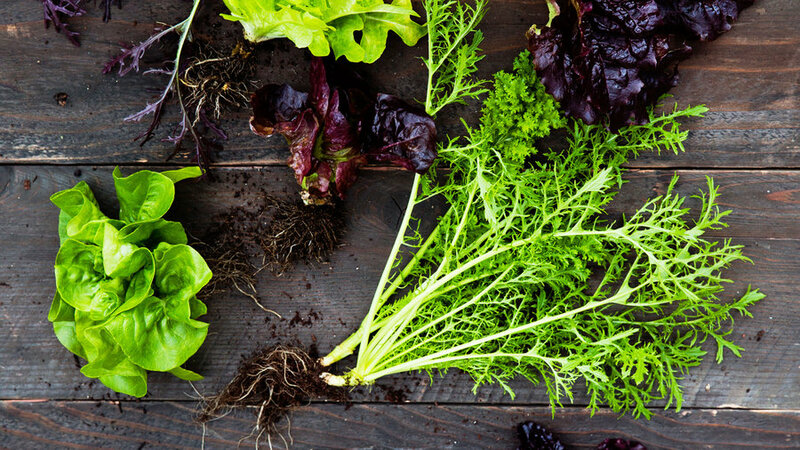 The tender greens are loved in Italy where the mild, crisp leaves are added to salads. Harvest whole heads or snip outer leaves of young plants. This new baby romaine is wonderfully crisp and juicy. Harvest whole heads when the upright rosettes are firm and well-formed. Best as a fall or early spring crop as leaves turn bitter in hot weather. The unusual bronze color and glossy finish of these baby romaines makes it a dramatic addition to salads. Compact, upright heads reach about 8 inches at maturity. 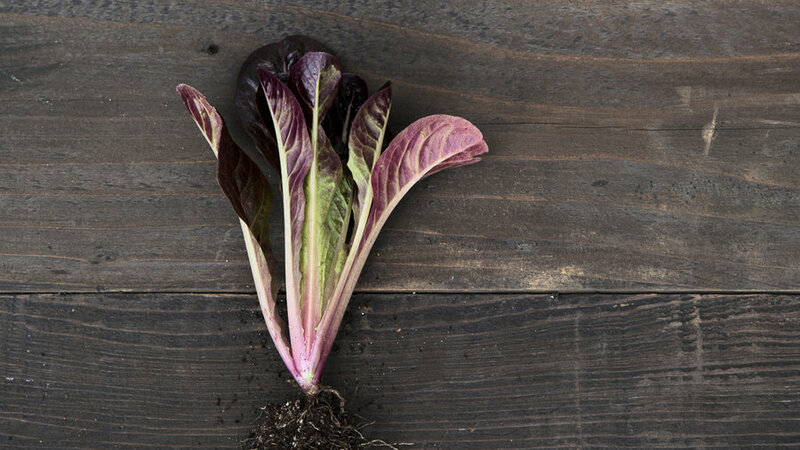 Texture is firm and crisp with a stronger flavor than green-leafed romaine.